Increase throttle response and decreases turbo lag with the VRSF chargepipe for your M235i/335i/435i. 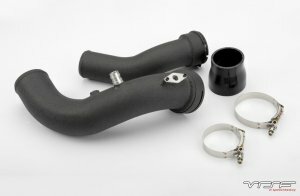 Our aluminum chargepipe features a CNC billet aluminum OEM throttle body flange and is finished in powdercoated black. The VRSF chargepipe retains the OEM c-clip in order to provide a better seal over a conventional clamp/coupler design. One plugged meth bung is also included for those who are currently using meth or interested in using meth in the future. Our chargepipes include a plugged meth bung and the couplers and clamps neccessary for installation. A OEM C-clip is also available in case your OEM c-clip is lost, damaged or worn.